Sleeping. Driving. Shopping. Working. Chatting. Sharing Photos. We’re digitally interacting 24/7, leaving a trail of identity data, like bits of DNA, everywhere we go, with everything we do. Got Facebook Home on your ‘Droid? Then Facebook (and your wireless carrier) knows where you spend your nights, because your phone stays in one location for 6-8 hours in the evening. And they know that you went jogging at 7:30 a.m., because via Facebook Home, your phone reports its location and even its velocity (kind of a slow pace today, huh?) as you jog. Then there was the cup of coffee at Starbucks – paid via Square…. You know the drill. You’re giving up all this info. For free. Well, mostly free – you do get to use apps you enjoy as a result of sharing data, and in some cases you may get discounts or coupons for sharing. But do you know what your data is worth? Are you getting fair market value from the companies you’re interacting with? What about the data you’re forced to share when you sign up for a cell phone or for Internet service or buy a toll tag? And what about credit card transactions, web cookies and that meta-data that the NSA scooped up? What’s the value of that data? 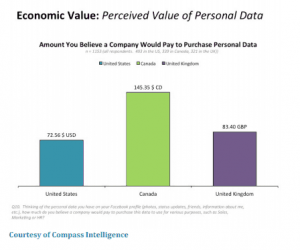 Consumers know that companies use their data, but their idea of the value of that data ranges widely. An online calculator priced my identity data at just over $.64. But in a recent study, respondents ranked the value of their personal data from $72.56 to $145.35, if it were to be purchased by a company. But consumers are actually giving it away, for free. Why should companies pay for data? Why should they let you know what they’re collecting, who they share it with, or who they sell it to? Why, as the old saying goes, pay for the cow if the milk is free? If they told you what they do with your information, or its value to them, wouldn’t you just stop sharing data? They believe that if they give you the chance to opt out, you will. Or would you? In a Compass Intelligence study only 41% of Americans surveyed said they’d rather turn off data access than have the company share their data under any circumstances. 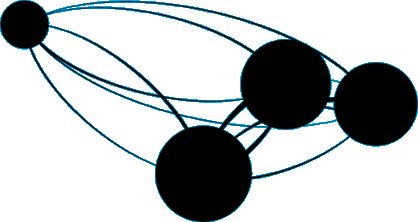 What would make data sharing acceptable to consumers? Being given the choice around how your data is used and the transparency to know who it’s shared with – this is Identity Etiquette (#identiquette), and more and more privacy advocates are pushing to give control back to the consumer. Mozilla has recently moved ahead with a plan that will allow privacy-conscious users to automatically block third party cookies – their CPO Alex Fowler said that their goal is to provide privacy, choice and control to their users. And FTC Commissioner, Julie Brill, is pushing an initiative called “Reclaim your Name” that wants to give consumers the knowledge and tools they need to reassert control over personal data held by companies. Why should companies be up front about how they use your data? 1) Because you will trust them more. In the Compass Intelligence study, when asked what would make them feel more comfortable about companies sharing their data, 34% of Americans said that they’d be more comfortable if they were asked which data could be shared, 27% wanted the ability to update or revoke access to data, and 23% wanted to know who the data would be shared with. 2) Because you will think more highly of them. The study also showed that if companies gave consumers the options mentioned above, 39% of Americans would be thankful that the company asked permission and the consumer would think better of that company. 3) Because companies will get better data from consumers if the consumer trusts them and will get something out of it. Consumers, privacy advocates, government regulators and companies have to come together to create new expectations for how data will be used and how both companies and consumers can benefit. Speak up. Support the companies who practice good Identity Etiquette. Demand choice, control and transparency from the companies you do business with. Expect value for your data. Treat it like a prized possession; don’t just give it away. You deserve better than that.